Gel nails have become very popular lately and it seems that artificial nails are the future of the nail industry. They are used for the many advantages it offers and especially for the very natural look and glossy looking than other types of artificial nails. Acrylic - No more using of too much files and buffers on the nail paint and making it painful. We work in a very different way. We sculpt acrylic nails for clients as per their requirement. Such as nail biters and non-nail biters, so it looks like natural nails. Thin, Flexible and Stylish Gel nails crafted with LED technology at our state-of-the-art nail bar give you most natural looking nails and extensions. 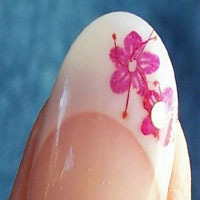 Gel nails give a person long, shapely nails that look especially striking when they're painted. Shellac nail polish claims to stand up against chipping and everyday wear and tear, which means that unlike many other brands of nail polish, the paint job can last as long as the gel nails.